Bwana Mbogo (BM) put Twiga through a shooting practice before they left for their South African safari, as she hadn’t had much time shooting rifles with scopes (and when she did shoot a rifle with a scope, she ended up in the emergency room: a story for a later date) . The practice started in February with a Ruger .243 and a 3×9 Leupold scope. Originally, she was going to shoot every weekend, but when it came down to it, she shot once in February, and then again two weeks before they left Texas for their safari. There was improvement, but Twiga was still a little apprehensive about shooting her first animal. 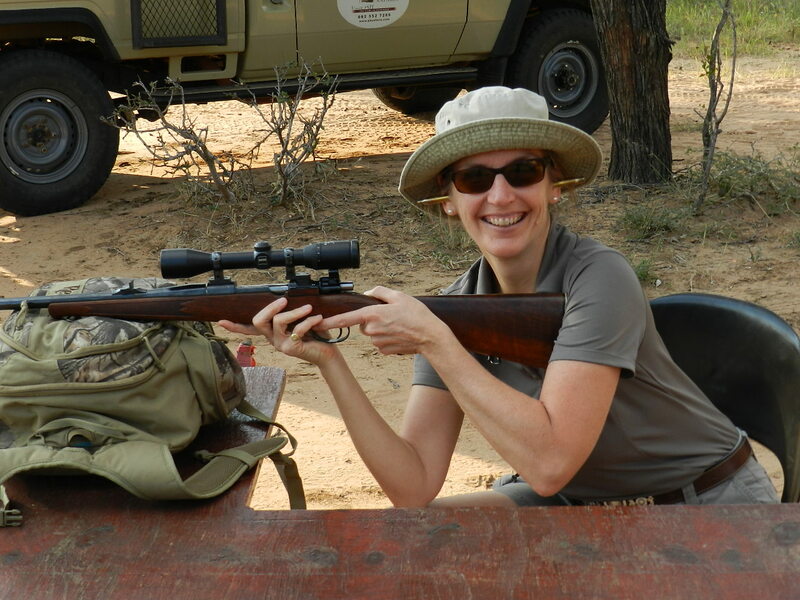 As the trip was going to include a beach week in Tanzania, together with the safari week in South Africa, BM decided that they would not take their own rifles. Instead the outfitter provided them with rifles. On the first day of the safari, they were taken to the practice shooting range on the game farm and given a .270 for Twiga, and a .300 Win. Mag. for BM. Twiga made sure to tell the PH that accompanied them to the practice range that she was a novice and thereby needed lots of pointers on how to shoot. The PH complied accordingly, starting with providing a wonderful set of earplugs (Twiga reacts to the shot and needs earplugs to reduce her anticipation of the shot). In good African ingenuity, the PH gave her empty cartridges for earplugs. Twiga’s first few shots missed the 100 meter target completely! BM and the PH modified her posture, her grip, her breathing, and her blinking, and finally she hit the target. But she was still shooting low and to the right of where she was aiming. The PH wanted to verify that the rifle was sighted in correctly, so he took a shot with the rifle. He hit the target dead center, so we decided that she was pulling the rifle and had to adjust her aim accordingly. We then went out to for our first evening hunt and inspect the game. We saw lots of game at a distance, and did a practice stalk where Twiga tried to learn how to walk softly and quietly, but we didn’t encounter a perfect animal shooting placement (very important for a novice hunter)! The next morning, we were assigned a different PH, who was promptly informed by Twiga that she was a novice hunter and needed ‘special handling’! The PH was extremely accommodating and made sure that he explained and prepared Twiga for every situation that presented itself. We spent that morning hunt looking out for one of our four plains game species (gemsbok, impala, kudu and warthog), tracking, learning how to use the sticks, learning how to follow the PH, learning how to get off the baki (safari truck) when an animal was spotted, and generally getting comfortable with being out on a hunt! By the time it was time for lunch and a rest, Twiga felt a lot more comfortable and confident about what she needed to do! The afternoon hunt was more of the same. Twiga’s confidence increased and by the time the PH spotted a trophy gemsbuck at dusk that was positioned for a good shot at approximately 150 meters, Twiga was ready! At the PH’s prompt, as if she’d been hunting for years, she jumped off the baki, the PH set up the sticks, she placed her rifle on the sticks, found the gemsbuck with the scope, confirmed that she had the correct animal with the PH, settled her breathing, gripped the rifle, aimed her rifle in the center of the kill zone (see red area in below photo), blinked and squeezed the trigger. 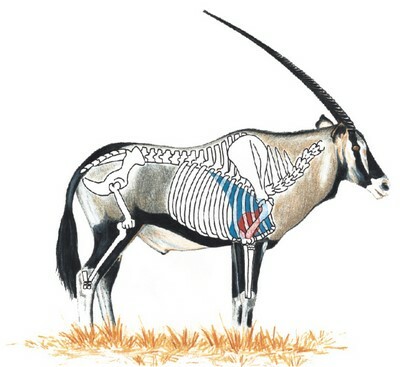 Twiga looked up after she pulled the trigger and saw the gemsbok continue running so she thought she had missed. BM and the PH thought she had hit the animal. 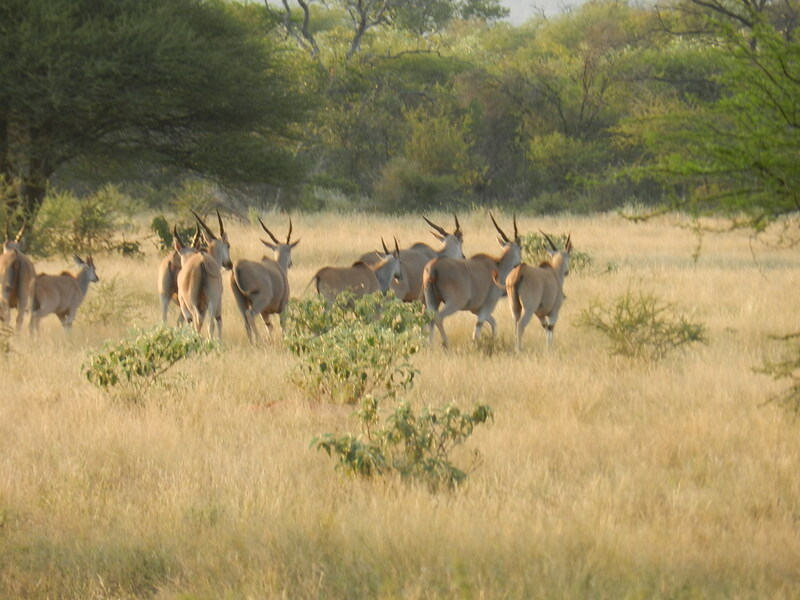 The gemsbok stopped at the edge of the thick bush and the PH asked if he could shoot the gemsbok, thinking that Twiga had wounded it. 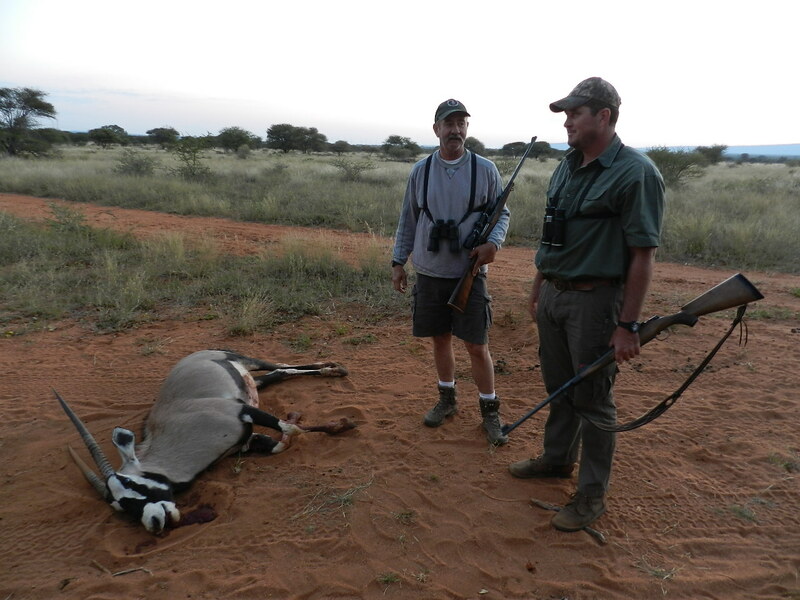 He was told he could and he took another shot at the gemsbok with Twiga’s rifle. The animal took off after the PH shot at it. So we all jumped into the baki to chase it down. Once we reached the spot where the animal had stood at the edge of the thick bush, our PH’s tracker spotted the blood. Watching the tracker at work was a beautiful sight. He was completely focused in looking for signs of blood and following the animal’s tracks. The tracker, PH and BM were running through the thick bush with determination, while Twiga fell slightly behind due to the thick brush (and lack of physical conditioning!). 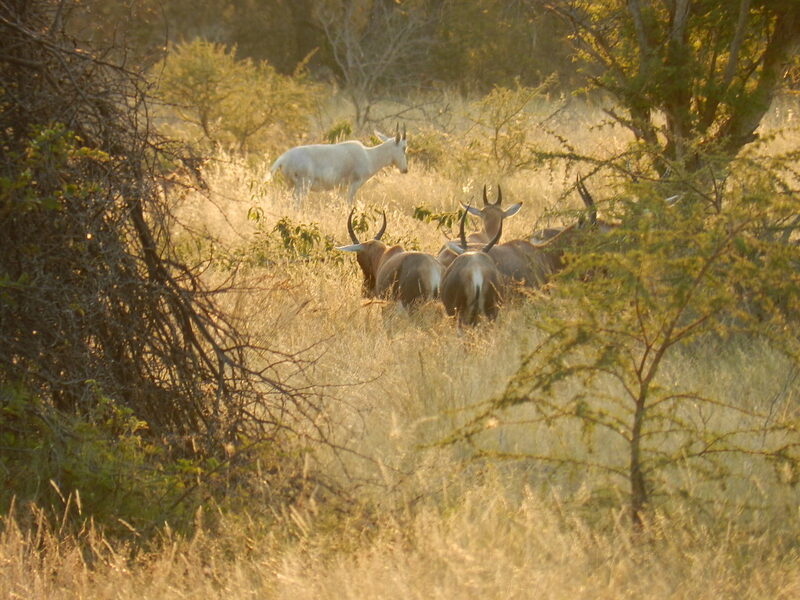 Twiga finally caught up to the men standing by the gemsbok laid down on the ground as he had bled out. The animal was wounded but not dead. The PH asked if Twiga wanted to make the killing shot in the spine, but her nerves had caught up with her, so she told the PH to take it. Twiga’s shot had hit the stomach, the PH’s shot had hit the top of the leg and broken it. As the PH and BM inspected the shots, and asked where I had aimed on the animal, they insisted that the rifle wasn’t sighted correctly. Given Twiga’s shooting experience, it was possible that she had pulled the rifle, but given that the PH’s first shot had hit low, they had a strong suspicion that the rifle had not been sighted correctly. Given that this was Twiga’s first animal kill, she was elated she had even hit the animal whether it was sighted correctly or not! 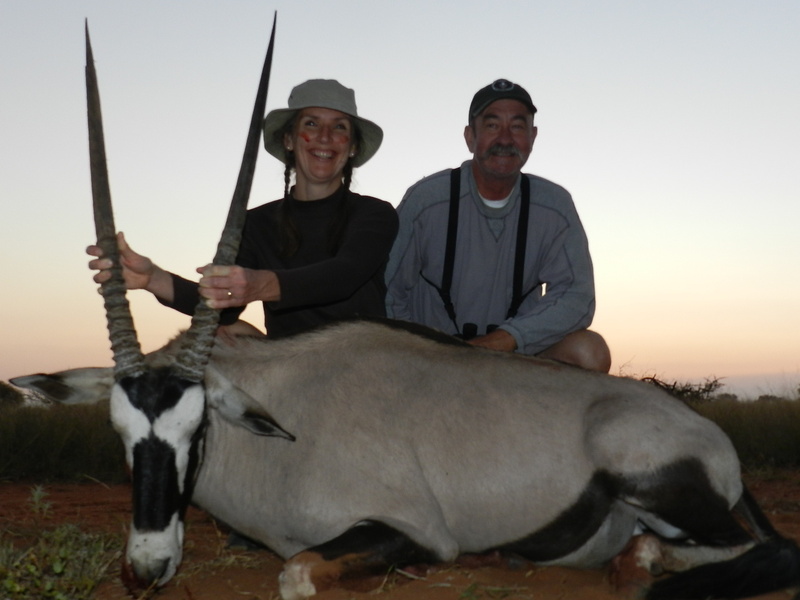 After photos and the celebratory first kill initiation, the gemsbok was loaded onto the baki and headed back to the lodge for more celebration! The following morning, our PH and BM wanted to confirm their suspicions that the rifle was not sighted correctly, so before we left for the morning hunt, we stopped at the shooting range to test the rifle. Their suspicions were confirmed. The rifle was shooting low by 8 inches and to the left by 3 inches! We learned our lesson: make sure that YOU confirm the rifle’s sighting! So it turned out that Twiga wasn’t a bad shot after all! She has a future as a huntress! This entry was posted in Africa, Hunting Experience, Plains Game and tagged Guns, Recreation, Rifle, Shooting range, South Africa, Texas, Twiga. Bookmark the permalink.